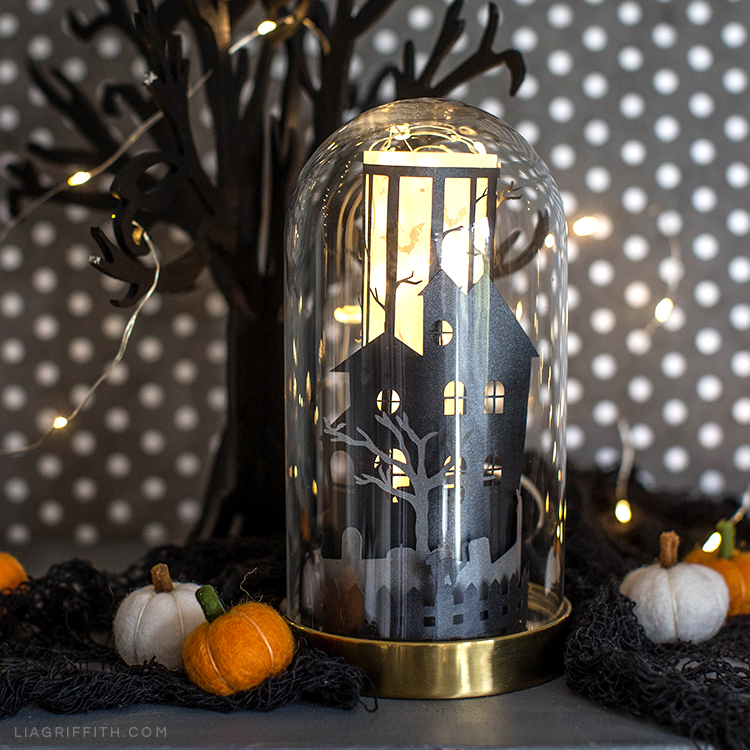 If you’re looking for DIY Halloween decorations that are simple to make, this haunted Halloween scene in a glass dome would look great on a mantel! We added some black netted cloth under our dome as well as a few of our mini felt pumpkins that we crafted the other day. You could also pair this haunted Halloween scene with our 3D haunted village, our paper village, or our shimmery haunted house. To create this haunted Halloween scene, you only need a few tools and materials. Then just follow the four steps below! Whether you’re planning a Halloween party or just love to decorate your home for Halloween, this haunted Halloween scene can help you create the right vibe. 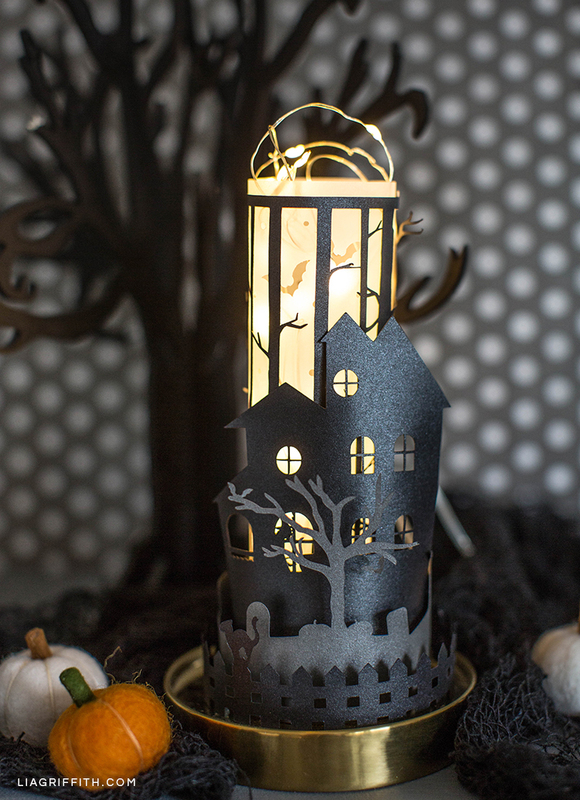 If you want some other Halloween decor ideas, you could make this “happy haunting” banner or this spooky little lantern. Oh and if you’re into copper wire projects, here’s a good one to try. Can you tell we love to decorate for the holidays? If you’re turning the lights off in your home for Halloween, you’ll definitely want some Halloween crafts that have lights in them. Also, if you’re having people over, you could even keep the lights off in just one area. Or maybe keep the lights off in your bathroom and decorate your countertops with the lantern we mentioned above and this glass dome. When you’re ready to make your own haunted Halloween scene, gather the tools and materials below. We recommend using a cutting machine, but you can also use scissors and a detail knife to cut the pattern. Either way, you’ll find both the printable PDF and SVG file below. Once you’ve cut your scene out, just follow the instructions listed here. Cut design on a cutting machine or with scissors and a detail knife. Glue along edge of vellum layer and press to close. Then glue tree layer around vellum. Glue along tabs included on haunted house, graveyard, and fence layers. Layer as shown in photo. Display papercut design in a glass dome or cloche. Add fairy lights or stack 3-4 LED tealights inside vellum layer. Love this scene? Here are some other projects you might love, too. Creating scenes for the season is super easy. And it makes such great decor! 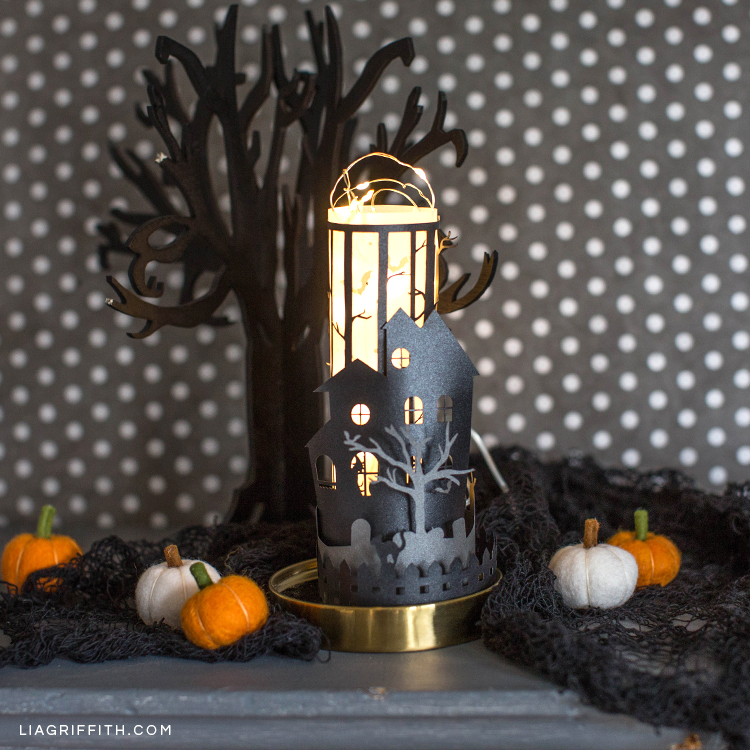 If you love this haunted Halloween scene for fall, you can make one for winter, too. Our 3D paper cabin is also a cute one for winter and upcoming holidays. We’re also really excited to see how you’ll decorate your home for Halloween! Make sure to share your Halloween crafts with us on Instagram or Facebook using the hashtag #MadeWithLia. That makes it easy for us to spot it—and for others in our crafting community to see it, too. And we may just repost it! If you want more DIY ideas for Halloween, you can find all of our Halloween crafts here. We also share new ideas every day on our social pages. You can find us on Instagram, Pinterest, Facebook, Twitter, and YouTube.